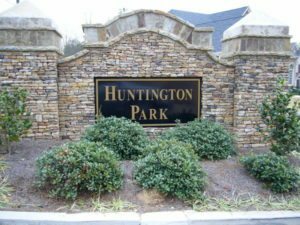 We recently visited a homebuilding site in the Huntington Park subdivision in northwest Cobb County, GA. They featured a home that was much larger on the inside than the appearance from the outside would lead you to believe. 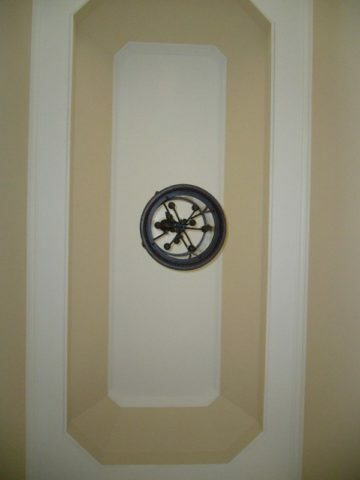 This home was impressive from the very first step inside of the front entryway into the 2-story foyer. 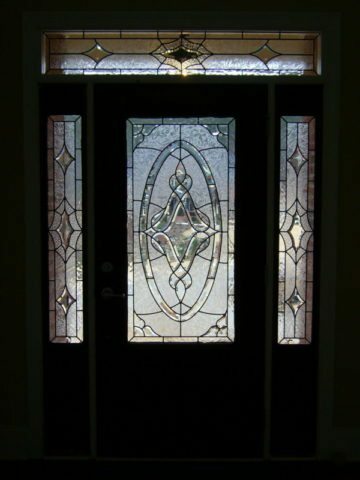 The front entry features leaded glass with side and transom windows also containing exquisitely crafted leaded glass. An impressive entry way for sure. A large two-story foyer waits inside with a very nice looking trey ceiling, beautifully detailed trim molding everywhere and a light fixture that I’d describe as understated elegance. It reminded me of a carriage light, for some reason, just on a larger scale. 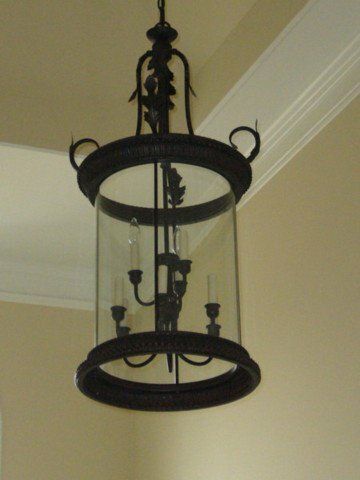 It might also be considered an Arts and Crafts style fixture. The foyer is immense, to say the least, and naturally leads you to the living room featuring a 2-story wall of windows looking into the backyard. The entire living room is very open with a ceiling that looks to be 20 to 22 feet in height. There is a wall of windows on one side of the room and an exceptionally detailed hearth and stone fireplace on another side. 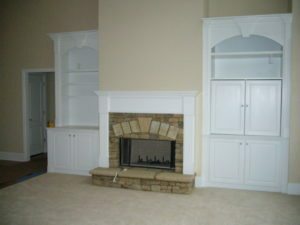 It actually seems to give the room a cozier feel because the hearth doesn’t stretch all the way to the ceiling, as in some homes we’ve seen. I’m not saying it’s a bad thing, it just gives the room a scaled-down feel. 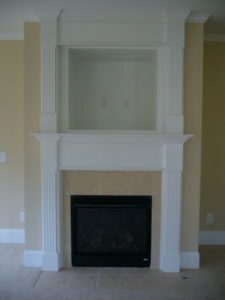 Flanking the fireplace are built-in bookshelves with an entertainment center in one of them. Built-in bookshelves are on our list of features that we definitely will require on our next home! This home also features a nice wide, straight staircase — a feature usually seen in high-end homes. 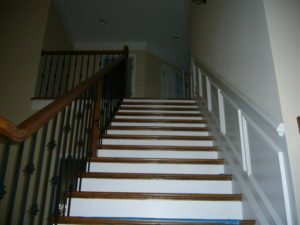 Having a straight staircase makes it much easier to maneuver large pieces of furniture through when needed. Staircases with right angles makes it more difficult during the move-in/move-out process. Some architects don’t seem to think through that little detail very well when they’re designing a home. They build a narrow staircase and/or a staircase that has either a right angle or — worse yet — a 180 degree turn that would seem nearly impossible to carry a decent-sized armoire through at all. I’m all about practicality when you design a home and that’s just something that an architect should never overlook. A staircase should not be an afterthought or something that is compromised in order to give a foyer or living room an extra foot or two of space. I talk more in-depth about the kitchen in this article. The 3-car garage is very nicely proportioned, with nice high ceilings. There is one large door for 2 cars and a second door for the “Sunday drive” car. 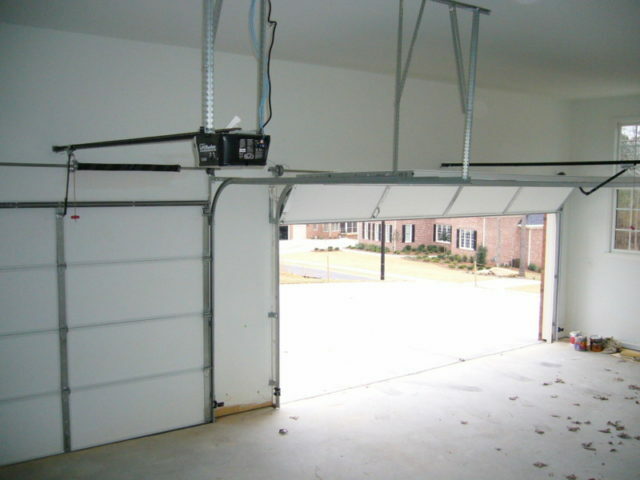 The builder installed Chamberlain Liftmaster chain drive openers. 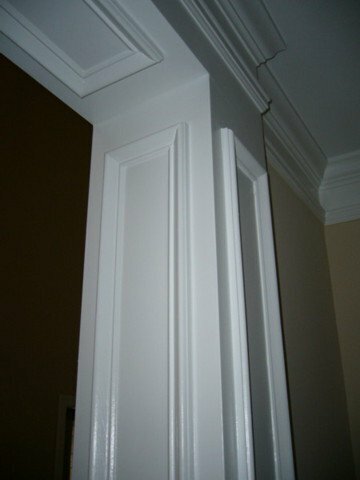 Chamberlain is very highly rated for residential use. However, this unit was a chain-drive (as opposed to a better quality belt-drive unit). This is definitely on my list of details that I will require on our next home (…or when the Genie I’ve got now gives up). The basement in this home is gigantic. It boasts high ceilings. However, at this point, it’s not a finished basement. 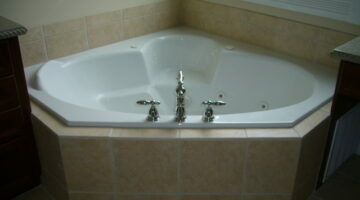 The basics of plumbing for a bathroom were installed so you could add on a bathroom at any time. Poured concrete walls are always something that we look for in new homes and, of course, in this price range they are standard. I did find an area of the foundation wall that looks like a couple of hours passed between concrete trucks — because there was a definite separation of layers rather than a continuous blend to give it a solid appearance. We also look for any kind of water infiltration due to faulty construction, and the basement in this home was as dry as a bone. There is a utility room under the stairs that contains a Rheem Guardian water heater, Trane XR80 HVAC system, data control box, Honeywell security control panel maintained by Ackerman Security, and a large electrical panel box. 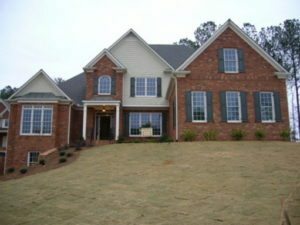 All in all, this is a nicely appointed home with lots of great details incorporated into an attractive and practical design, 2-story foyer not withstanding.